Manila—(PHStocks)—Philippine stocks succumbed to profit taking as investors lock in their gains amid the recent bull run that was further lifted by Standard and Poor’s investment grade rating for the country. The mainboard Philippine Stock Exchange (PSE) index slid by 0.62% to 7,170.65 on Monday, May 6, but not before hitting a new record intraday high of 7,284.34. 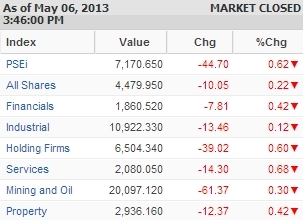 All counters are in the red; led by the Services index, which dropped by 0.68%. The Holding Firms sector followed, losing 0.6%, while the Financials and the Property sectors both shed 0.42%. 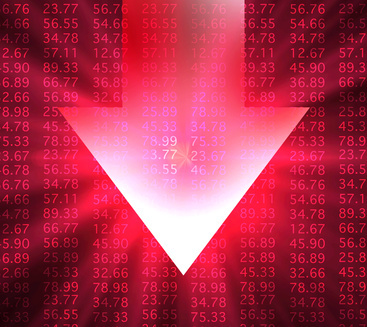 Overall, the wider All Shares index dropped slightly by 0.22%. Trading was moderately heavy, with value turnover reaching PhP8.77 billion on 3.7 billion shares traded. There were 78 gainers against 95 decliners, while 48 stocks were flat. The top active stocks for the day are SM Investments Corporation (SMIC, PSE: SM), Alliance Global Group Inc. (PSE: AGI), Metropolitan Bank & Trust Company (Metrobank, PSE: MBT), Philippine Long Distance Telephone Co. (PLDT, PSE: TEL), and Megaworld Corporation (PSE: MEG).